The state of Uttarakhand with its rugged terrain, snow peaked mountains, dangerous gorges, sylvan valleys and quaint villages is an ideal locale for tourists. The climatic variations in this exotic region give rise to the difference in vegetation and wildlife. Binsar in Uttarakhand, situated 35 kilometers from Almora, is a haven for honeymoon couples, trekkers and common tourists alike. There are forests with tall shady trees and a luxuriant growth of shrubs and different hued flowers. The only traffic that you are likely to encounter on your way is the herds of goats and cattle, lazing around in the sylvan green of the region. Situated at an altitude of 2400 meters, Binsar affords wonderful views of some of the deadly mountain peaks like Nanda Devi, Chaukhamba, Nanda kot and the likes. Taking advantage of its exotic natural splendor, many hotels have been constructed in Binsar. These hotels provide you all the basic facilities as well as a comfortable stay midst the nature. However you would be well advised to check for heaters and hot water before you check in a particular hotel. Low season discount can be availed during the off season period. Most of the hotels in Binsar organize group treks, mountain biking and an expedition to the mountain villages in the laps of nature. You can put up in Mount resort Khali if you are particular about class and luxury. The Club Mahindra Valley Resort, a few kilometers away from Binsar also makes for a very comfortable stay. 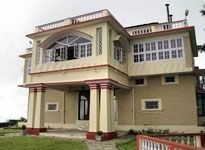 If you are traveling on a shoe string budget you can book a room in the spacious government guest house which overlooks the magnificent Almora hills. 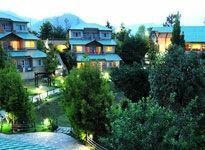 Approach the hotel authorities of the hotels in Binsar for a day out in the Binsar wildlife sanctuary, which shelters animals like musk deer, leopards, and wild boars.